No matter what you think of it, Wikipedia is powerful, especially for search. But exactly how it influences search is complex and gets at the heart of how Google continues to develop its algorithm. Whether you’re starting the build out of your company’s page, or just trying to find out whether your business merits one, here’s what you need to know. Encyclopedias are tertiary sources—surveys of informational landscapes constructed from primary and secondary sources, which, respectively, gather information and interpret it. This places Wikipedia company pages in a unique space, saddling them with a burden of notability that must exceed a business’s primary purpose. (Wikipedia pages are not an advertising or public relations strategy, for a number of a reasons.) Businesses that struggle to gain approval for a Wikipedia page do so because they lack knowledge of reference publishing standards, their business fails to meet the threshold of notability, or both. This largely excludes common sources of information on businesses, including company websites and press releases. Relying on those inevitably falls short of Wikipedia’s editorial standards, leading to removal of the page, or a long list of disclaimers that undermines the independent authority a Wikipedia page provides users who, it’s worth noting, are attempting to determine whether they can trust a business. Executed improperly, a Wikipedia company page may erode credibility. In general, Wikipedia recommends that users with a close association to an organization or business avoid writing on the topic, as proximity to the subject matter makes adhering to a neutral viewpoint more difficult, especially for those unfamiliar with reference publishing standards. As an editor, disclosing a conflict of interest is a start. Still, Wikipedia is most interested in the quality of the final product, and its standards are a means to that end. You can write about whatever subject you choose, so long as you research and write according to their guidelines. Some businesses fear Wikipedia company pages. Search engines love Wikipedia (more about that later), and they serve even subpar Wikipedia pages high on the first page for almost any query. This typically raises two concerns. First, that a Wikipedia company page will steal one of the top spots from a site, sending visitors to a third-party site instead of the company site. The greatest fear, that Google will serve a Wikipedia company page above a homepage, is unwarranted. Google consistently shows company homepages above Wikipedia company pages for brand queries. Anecdotal research suggests that, for a simple brand query, you can expect a Wikipedia company page to appear fourth or fifth—usually the first result that’s not on your domain. The fifth result for “Counter Culture Coffee”—and insight into how Google uses Wikipedia to gather information about a business. The second concern, that Wikipedia represents a liability for your brand, is worth considering. You will never have independent control over your Wikipedia page because it is forever publicly editable. Anyone can anonymously change the content on the page. (Some high-value pages have meager barriers to entry, such as 10 prior edits to any page under the same username.) However, you do retain the editorial standards of Wikipedia, which vastly exceed those of standard review sites, where damage to your brand is far more likely to occur. In other words, the burden to weaken your brand via edits to your Wikipedia company page must conform to the same notability standards required to create it. Unless third-party sources remark on a particular negative issue or event within your business, you’re protected from negative opinions remaining on your Wikipedia company page, though you may still need to remove false, opinionated content or lobby for its removal on a Wikipedia “Talk” page. For search, the benefits are far clearer and, at times, dramatic. From a purely search perspective, Wikipedia provides value by establishing authority and organizing information about your business in a way that’s accessible to search engines. Google was born from the need to approximate authority on the Web. Early search engines relied on on-page factors, unable to distinguish between the same content on the New York Times website and a personal blog. Google’s founders, Sergey Brin and Larry Page, took on the challenge by applying citation notation, the academic standard of citing sources, to the Internet. (They first wrote about it in a graduate school paper at Stanford University.) An online source was a link, and the resultant link graph provided a viable stand-in for authority. A site with many links pointing to it (backlinks) was more authoritative on a given topic than one without any backlinks—all the better if those backlinks were from sites that had high-quality link profiles as well. But, like any search algorithm that relied on human edits, it could be spammed. Even as Google has refined its algorithms, authority remains a fundamental challenge. And that’s where Wikipedia comes in. No algorithm can replicate fully the ability of human editors to discern quality (at least not yet). Wikipedia, though, serves as an effective proxy for Google. The encyclopedia’s editorial standards provide an organic, human algorithm that Google trusts to organize and validate information, and not just information contained within Wikipedia articles but also which people, organizations, or businesses merit an article. This is increasingly important given the shift to semantic search. Semantic search reflects the growing intelligence of search engines, notably Google, and their ability to return results outside explicit words in a query. 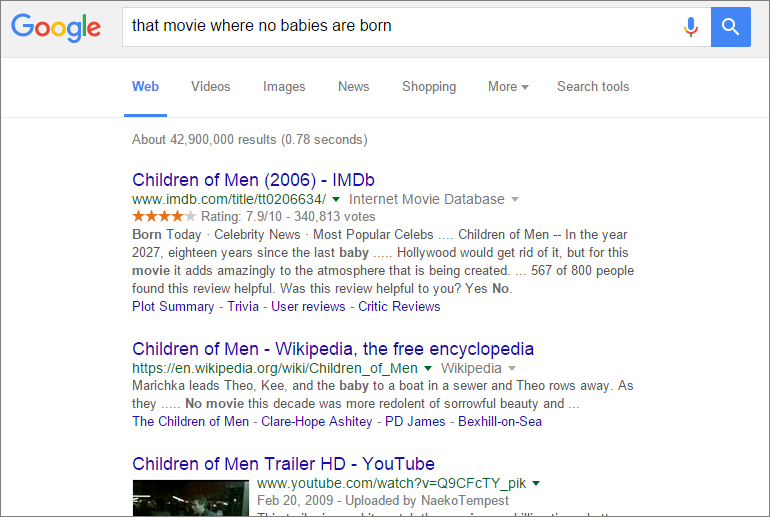 An easy example is a search such as “that movie where no babies are born,” which returns the IMDB page for Alfonso Cuarón’s Children of Men. The search engine uses context within the query to discern user intent, even though the query does not contain any words from the title. Semantic search generates results based on implicit, rather than explicit, meaning. Semantic search depends on search engine identification of entities, or topics. Traditional search connected queries to disparate pages via relevant keywords; semantic search connects queries to entities first, then to the set of pages about that entity that match other keywords and topics within the query. (A search engine may also hedge its bet, returning a varying percentage of documents tied to the perceived entity versus keyword-focused results based on its confidence that a user is, in fact, searching for an entity.) The first entities were domains, but the list has grown. Movies are a great example. So are brands. Many small businesses lament that Google has dedicated increasing space to major brands on search engine results pages (SERPs). A search with an explicit or even implicit connection to a brand returns SERPs that, increasingly, are filled with pages from that brand’s website. Google has stated that this adjustment assumes a user intended to search with a “site:” prefix, which would have returned pages from a single domain, but simply was unaware of the operator. From the perspective of Search Engine Optimization (SEO), this is a further nudge to shape websites around a concept, rather than a collection of disparate, keyword-targeted pages. The sum is more than its parts, and building a brand that’s synonymous with a product is powerful. As Bill Slawski notes, newer patents from Google have investigated this association by assigning higher quality scores to sites when user queries include a site name or brand name in the query along with a product or service (“nike running shoes”, for example). What does this have to do with Wikipedia? A Wikipedia company page establishes your business as a “brand entity” (Google’s nomenclature) in search engine eyes. The content of your page, beyond its simple existence, associates core services and products with your brand. It is a shortcut equivalent to the incremental association built via thousands (millions?) of “brand + product” searches from users. More than any other editable source, Wikipedia offers businesses the opportunity to communicate their purpose and have Google take their words at face value. Further, Wikipedia’s disambiguation pages, which list all similarly named topics, help Google understand subtle differences among terms. If your company name is shared, in part or whole, by an array of people and ideas, Wikipedia’s disambiguation page provides Google the subtle clues it needs to serve your site highest for the most relevant brand queries. The surge of impressions, click-through rate, and rank for brand queries. A disclaimer: Click-through rates for brand terms soared in part because the old Wikipedia page still appeared in the knowledge panel for brand queries. (The name change was partial.) This likely caused confusion among searchers, and the tightened match between the knowledge panel and homepage generated greater clarity. In particular, this explains the increase in click-through rates for keywords in which the average position stayed constant. The corrected Wikipedia page also helped Google discern when not to show the client site. 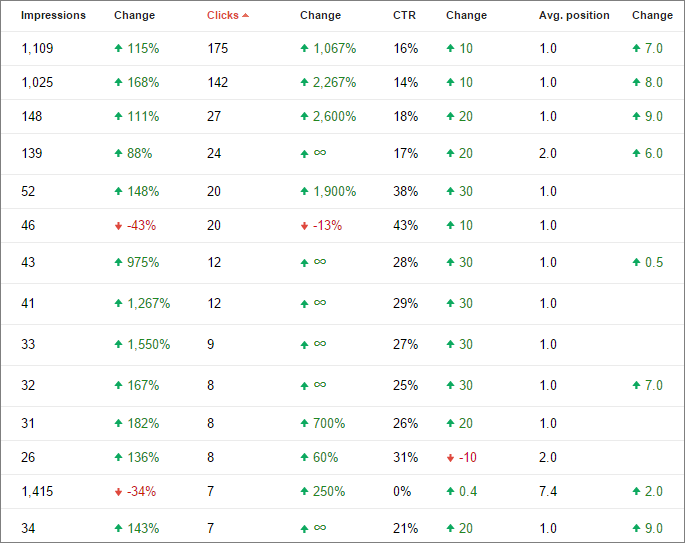 The negative trends in the chart reflect the removal of the site from irrelevant search results for which, as a simple keyword-targeted search, it previously made sense to show. Positive movement for non-brand queries was consistent if less dramatic. Simultaneous, unrelated work on the site makes it more difficult to isolate the impact of the Wikipedia page correction. Company Wikipedia pages often are built for prestige, or on account of some mystical belief in the power of Wikipedia. The truth is that Wikipedia has the greatest impact for brand queries and for establishing a company as a brand entity in the eyes of Google. The results of my own accidental experiment are unambiguous: Google trusts Wikipedia and uses it to build lists of entities and associations for those entities. Wikipedia offers editorial guidelines, and effective monitoring of those guidelines, to validate that trust. I don’t advocate a strategy that reverse engineers brand building, that exploits Wikipedia as a means to unwarranted authority. However, companies that meet notability guidelines and fail to use Wikipedia miss an opportunity to build powerful trust—the most elusive value to accomplish algorithmically—with the world’s most powerful search engine, and a vital source of new customers.